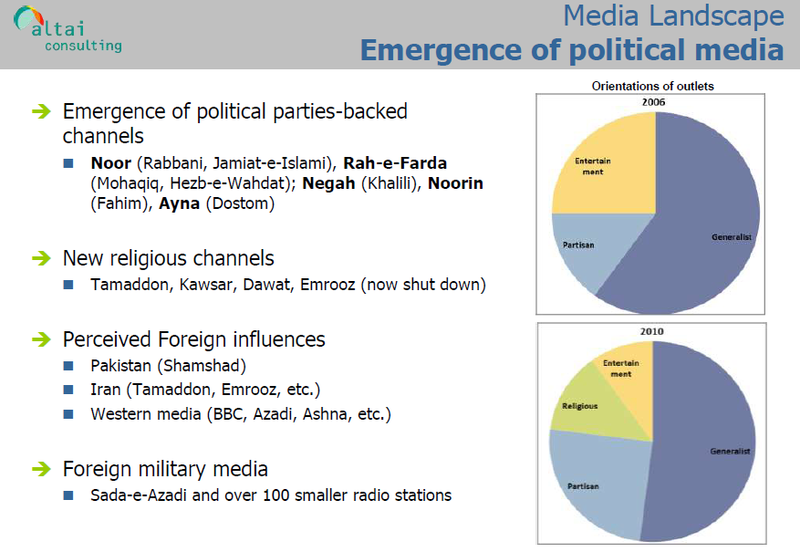 In 2004-2005, the United States Agency for International Development’s (USAID) Office of Transition Initiatives commissioned Altai Consulting to conduct the first comprehensive media evaluation of the Islamic Republic of Afghanistan, looking at the impact of the Afghan media on opinions and behaviors three years after the beginning of the country’s reconstruction. The evaluation found, among other things: that Afghans were avid and sophisticated media users and that cultural barriers to media use were less significant than previously expected; that the radio played a predominant role throughout the country; and that media are instrumental in social progress and education. However, since publication of that report, Afghanistan’s media sector has seen important changes. To inform future assistance from the international community to the Afghan media, it was deemed necessary to assess the current state of the Afghan media – by reflecting a full and accurate audience profile, to determine program preferences, to measure the impact of the Afghan media on local opinions and behaviors and to gauge Afghan expectations in terms of programming and messaging. A large-scale research project was thus planned and conducted from March to August 2010. This research included a deep probe into the media sector and the public’s behaviors and expectations. The methodology used to achieved this included a combination of: literature review; direct observations; key informant interviews with most relevant actors involved in the media sector; 6,648 close-ended interviews in more than 900 towns and villages of 106 districts, covering all 34 provinces of the country; an audience survey on more than 1,500 individuals run daily for a week; about 200 qualitative, openended interviews; and 10 community case studies. Such an effort guarantees that results presented here are fairly representative of the Afghan population at large.